Don't remember the banned bit as I was probably too old by then......we were left to our own devices and if we happened to get hurt it was our own fault. I know if there were too many on one side if it banged the centre pole hard it would recoil like mad and could get thrown off if not hanging on. My favourite was the 'Witch's Hat' too! Never heard of it being called a Maypole before though! Didn't they end up getting banned because of the danger of being squashed between the central pole and the frame? I also remember the huge slide which was the reason my friends and I used to walk from Frindsbury over to Victoria Gardens to play. The Maypole was another of my favourites...my friend from oop North calls it the Witches Hat! Never ever heard it called that down here. Has anyone? This thread has brought back some memories. I remember the huge slide in Victoria Gardens and the trips to Barts to get patched up for those unlucky enough to fall off it. No soft landings in those days. 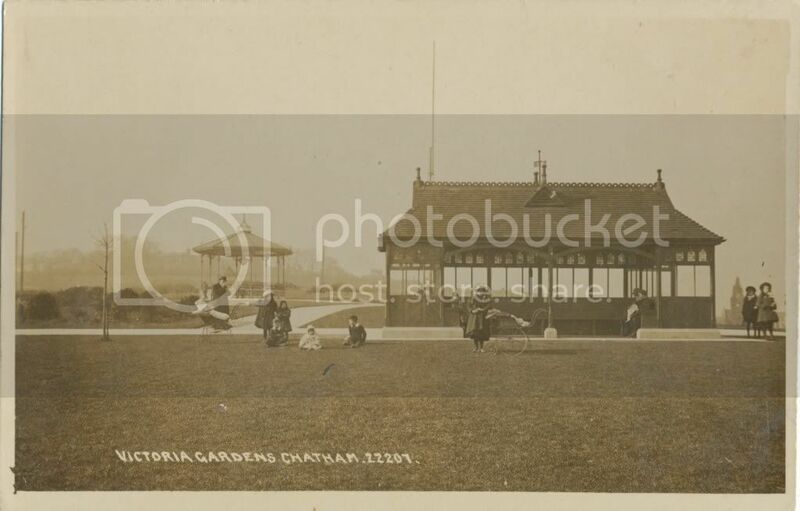 I also remember the covered shelters both at Victoria Gardens and Jackson's Field. The covered shelter in the north west corner of Jackson Field; opposite The Cut on City Way, was our `hang out` during the late fifties and early sixties. As kids we tended to ignore the council supplied playground attractions nearby and all played in and around the poorly fenced off water tank. As teens, the shelters were the place for a good old chinwag when it was raining, or the place for a bit of courting before your bum went to sleep on the hard wooden slats. I see on GE that the shelter survived into the nineties, but has now gone. Great photos! I remember the covered shelters, they were great, spent a lot of time there in my school days with school girlfriends and used to love sitting on the grass looking at the river when I was older, waiting for the pubs to open. Met my first wife there when she was sunbathing. Oh well! Not always good memories lol. Thanks Davidt, lovely old pics. I have a picture of myself playing by the rose garden that was in Victoria gardens back in the late 50/60s. Its frequented by local drunks and drug addicts and I do believe 'girls of the night' now...Such a shame. Well, I used to have a beer in the British Legion near the park entrance (now flats) then used to walk across the park at night to the New Rd. as there was a private drinking club opposite in one of the big houses called, if I remember rightly, the GI Club. In those days walking through the park you would often see men coming out of the bushes so it was always that sort of area. Mind you there was never any trouble and no one ever bothered you. It`s frequented by local drunks and drug addicts and I do believe 'girls of the night' now...Such a shame. 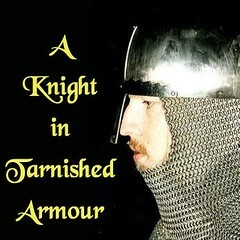 Do any bands still play there? I remember years ago they played every Sunday during the fine weather, sometimes drawing a good crowd. I lived in Albany Terrace until I was 6 and Victoria Gardens was my playground. The strongest memory I have of it was playing on the bandstand, or sitting on the grass watching the ships going up and down the river. When I was a child in the 60's living on the Luton Road, my parents used to walk us to the Victoria Gardens and/or Jacksons Field to play on the swings and slides there on a Sunday afternoon, we then walked back again. My father later told me it was to tire us out so we slept well! 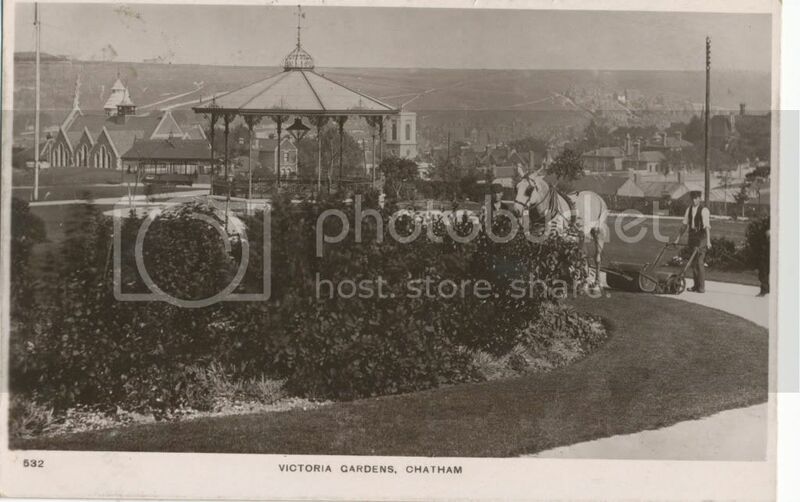 I can remember the Victoria Gardens with its old bandstand and fine views but also because you got an elevated view of Chatham station although we were always told not to go too close to the fence in case we fell over. My sister and I used to lay on the ground and try and listen for the trains running in the tunnel below. I seem to recall you could hear the rumble through the ground unless this was just childhood imagination. Victoria Gardens were created on land previously owned by the War Department, the Napoleonic Fort Pitt being on adjacent land. 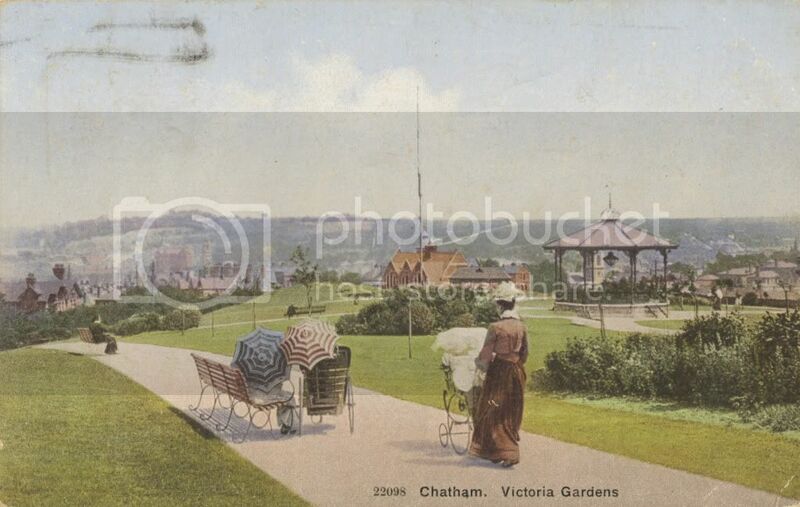 The Chatham Corporation leased and then bought the area and opened it as a public garden to mark Queen Victoria's Diamond Jubilee in 1897. 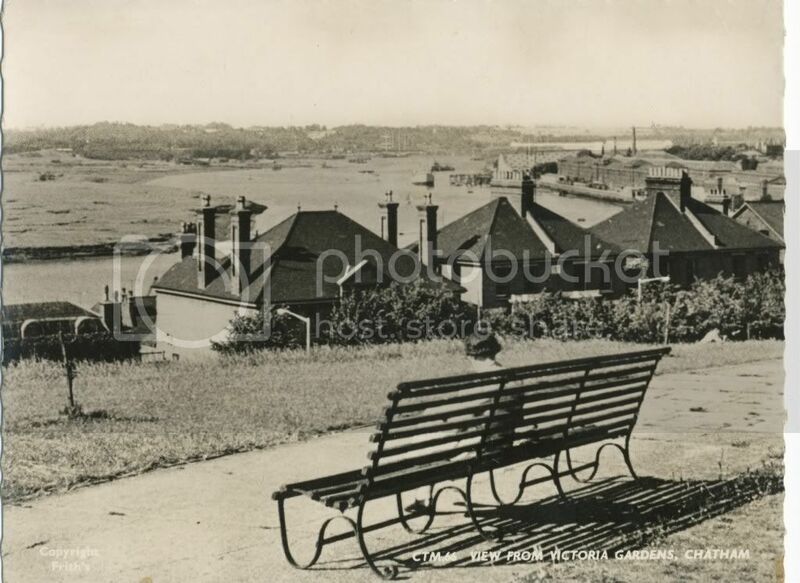 They landscaped the grounds which became very popular for strolling and admiring the views over the river Medway. Concerts were held in the Summer at the bandstand, as well as an open-air service on Armistice Day. The cannons in front of the flagpole were captured during the Boer War and presented to the town. Anyone know what happened to the cannons ?